Subluxations (misalignments of the spinal vertebrae) are one of the most common causes of neck and low back pain. When vertebrae are misaligned, they put pressure directly on spinal nerves, causing pain. Muscle spasms may set in which can increase the pressure further. This extra pressure can cause even more inflammation and irritation, which leads to more pain. And the cycle continues. Often times stretching and massage may only temporarily relieve the pain because the cause (subluxation) has not been addressed. A chiropractic adjustment focuses on correcting the cause. 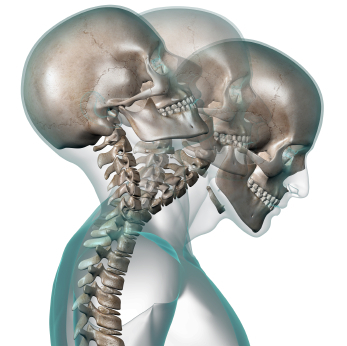 Whiplash is most commonly received from riding in a car that is struck from behind or that collides with another vehicle or object. When the head is suddenly jerked back and forth beyond its normal limits, the muscles and ligaments that support the spine and head can be overstretched or torn. The soft, pulpy discs between spinal bones can bulge, tear or rupture. Vertebrae can be forced out of their normal position, reducing range of motion. The spinal cord and nerve roots in the neck can get stretched and irritated. While occupants can suffer considerable soft tissue injury, the car may only be slightly damaged. The resulting instability of the spine and soft tissues can cause headaches, dizziness, blurred vision, pain in the shoulder, arms and hands, reduced ability to turn and bend, and even low back problems. As the body attempts to adapt, symptoms may not appear for weeks or even months later. The chiropractic approach to these types of injuries is to use specific chiropractic adjustments to help return spinal function. After a thorough examination and case history, the doctor will recommend a series of visits to help restore proper motion and position of the spinal bones. If caught early enough, inflammation can be reduced and scar tissue can often be minimized. Consult a Doctor of Chiropractic before enduring constant headaches, depending upon addictive pain medication, or submitting to surgery.